Hello friends! 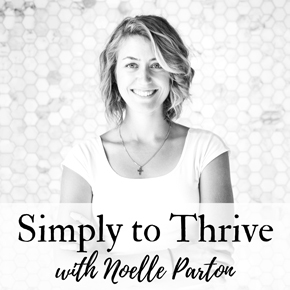 This week for me has been continual reminders of true peace and the source of true peace – Jesus Christ. The only source of lasting peace is in Him. And I’m also reminded of how delicious this sourdough buckwheat flatbread is. 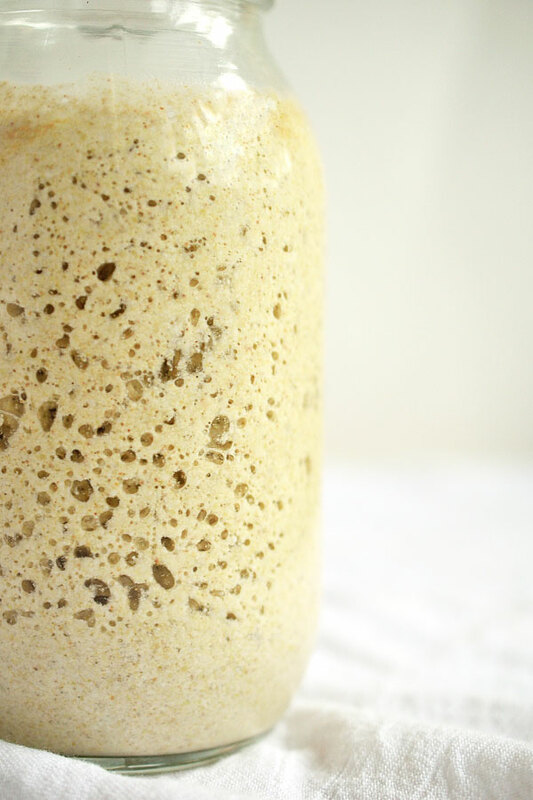 Only 1 main ingredient – buckwheat, naturally fermented. Way to simple. 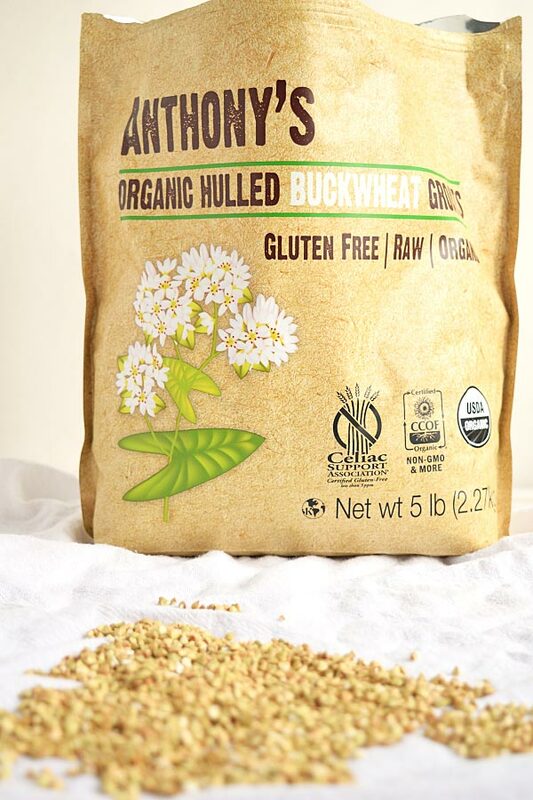 With this recipe, I’ve got a quick review of the buckwheat from Anthony’s Goods I’m using. I’m featuring their raw hulled, organic buckwheat groats (check out my Mulberry Acai Milkshake from last week for another Anthony’s product!) in this awesome recipe. 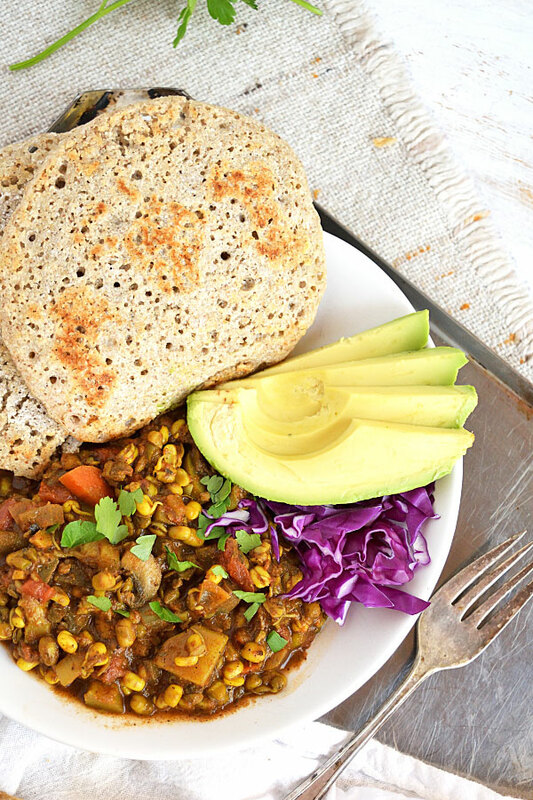 This buckwheat is so amazing. I can usually tell by how easily something sprouts if it’s fresh and quality. Although I don’t used them sprouted in this recipe, I did test some out and they sprouted in less than 24 hours. which is pretty quick. The groats also have a wonderful shape, color, smell, and feel to them. They’re certified gluten-free by CSA, so is perfect for those you have to be very cautious about gluten. When mixing the batter, look for the right consistency. You want something similar to pancake batter, so add water little by little while stirring, until that consistency is reached. Have fun changing the flavor around! Add different spices or a even little sweetness. Start small, with about a teaspoon of seasoning and increase based on taste. 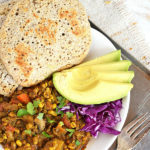 A simple flatbread with only one main ingredient- buckwheat, a gluten-free grain that’s rich in protein, fiber, and key vitamins and minerals such as potassium, magnesium, and iron. The fermentation increases digestibility and yields a wonderfully unique flavor. 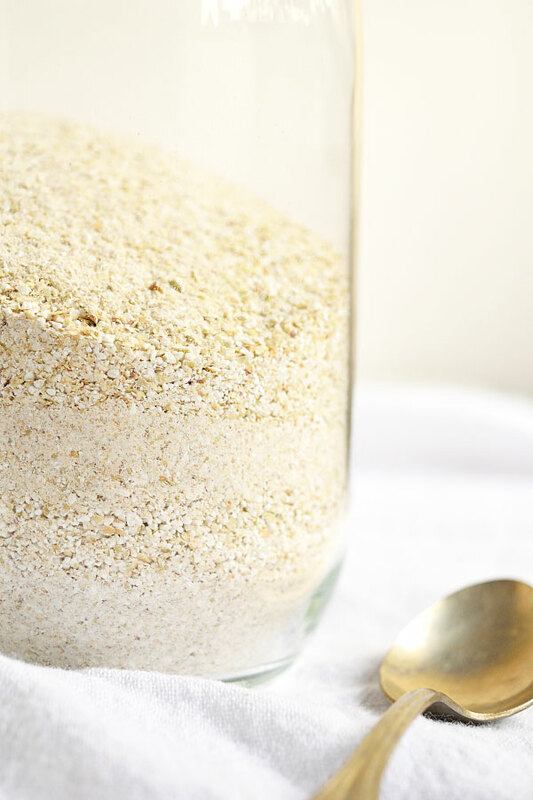 At least 24 hours in advance, grind the buckwheat in a blender or food processor until fine. For about 6 flatbreads, use about a heaping cup of flour. 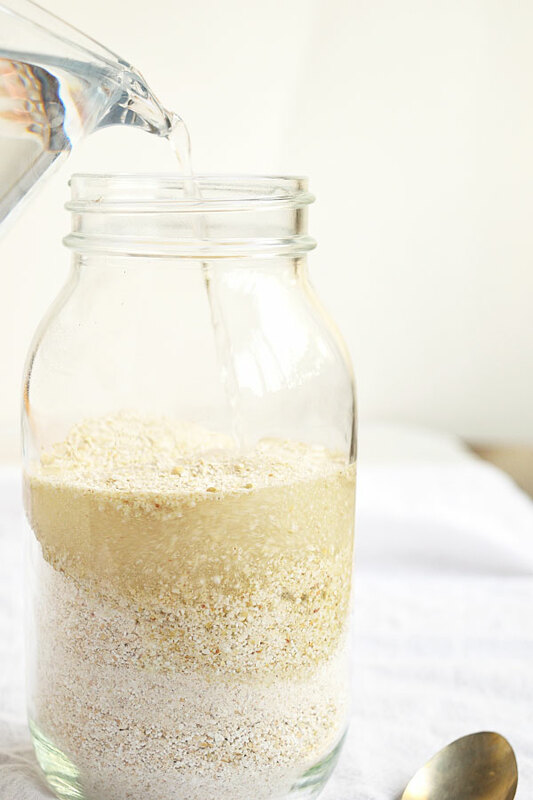 Place the flour into a jar and thoroughly mix with water until you reach a consistency similar to pancake batter, runny but not watery. Add a splash of raw apple cider vinegar to help facilitate the fermentation if desired, although not necessary. Allow enough room in the jar for the batter to double in size. Cover and let sit at room temperature for at least 24 hours. It is ready when you can see small bubbles and air pockets throughout, and it has roughly double in size. A thin layer of discoloration may appear on the top, simply scrape off with a spoon. When ready to make the flatbread, heat enough coconut oil to evenly coat the bottom of a cast iron or non-stick skillet over medium heat. Once hot, pour or scoop about ¼ cup of batter, or more depending on desired flatbread size, into the skillet and evenly spread out until about ¼ inch thick. Let cook several minutes until it is golden brown on the bottom side and releases from the skillet. Place in a oven-safe dish and keep in the oven on warm while cooking the remaining flatbread. 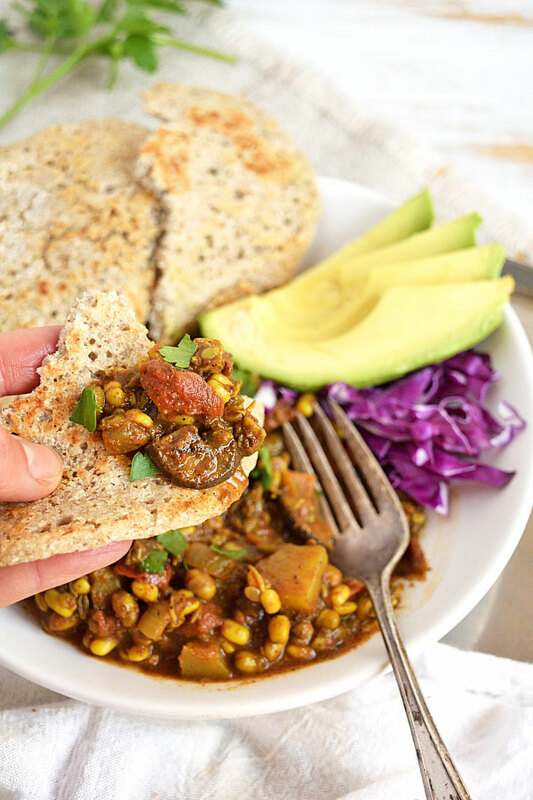 Use additional coconut oil as needed to continue cooking the flatbread. Best if served immediately while still warm with a main dish such as soup or curry. 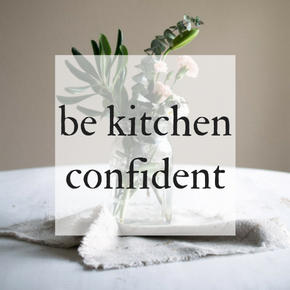 Grinding your own flour is best for the highest amount of nutrients and freshness, but if not able you can use store-bought buckwheat flour. I have to try this! I make crepes with sprouted buckwheat groats and water, but I love this twist on sourdough & buckwheat!! 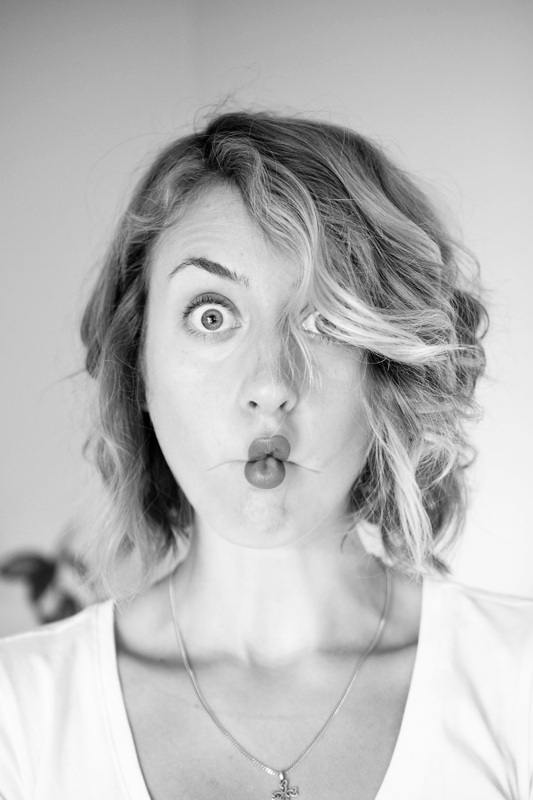 Does the batter smell fishy after fermenting? No, it should smell just slightly tangy. No it will not be fishy, it should smell just slightly tangy though. 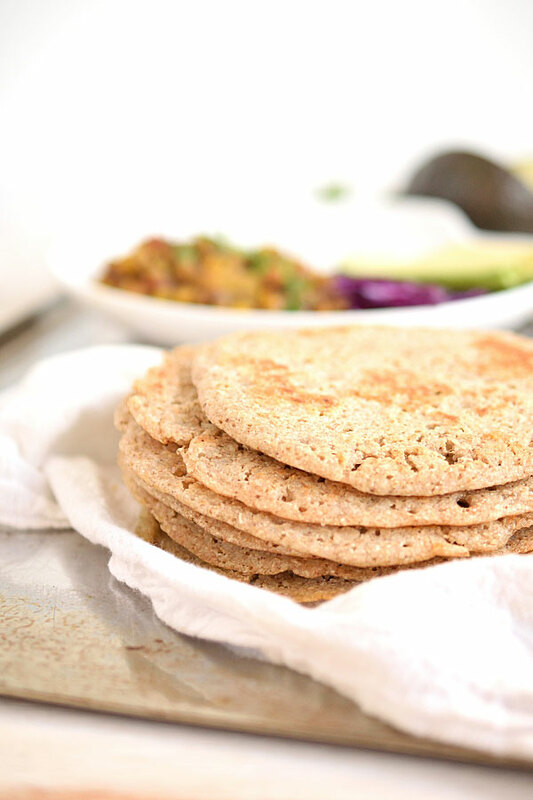 Can you use pre ground buckwheat flour? Hi, I’ve tried this recipe but it didn’t rise. Just kind of became a little hard. Can you specify maybe the measurments and what should I cover the bottle with so the fermentation starts. and about 1 cup water. I just set a lid on it. Something to keep bugs out but it doesn’t have to be sealed. Let me know if that helps! Can you use buckwheat flour instead? Yes, pre-ground buckwheat flour will work! Enjoy! Great idea! What is the meal you show pictured here served with the bread? It looks delicious together! Do you have a recipe for it? Hi Sean, it was a sprouted mung bean curry that I threw together and some raw veggies on the side. The curry had some veggies like onions, mushrooms, carrots, zucchini, curry powder, coconut butter… I don’t have exact recipe posted but something similar to that is delicious! Fast food junkie myself, but I needed to fix gluten free snacks for a friend. I tried this out on my husband and I first to see if it was edible. Not only is it edible it is really good! I topped with cracked pepper and sesame seeds. We loved it! Hi Donna, it’s so great to hear that you and your husband loved them! Glad you enjoyed. God bless! Hi, do you think it would work to put the jar in the fridge after twenty four hours and then use it over a few days? Thanks, these look great! Hi Mary, yes it will hold. It will most likely lose some of the air bubbles, but will still be good to eat! Enjoy and God bless!